ABBYY PDF Transformer+ is an easy-to-use, versatile tool that lets you create, edit, comment on, and convert PDF files to other editable formats such as DOCX and XLSX. 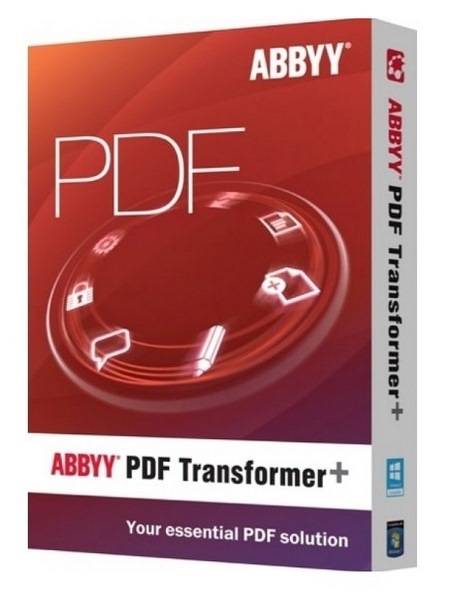 ABBYY PDF Transformer+ can convert paper documents to searchable PDF files, merge files of various formats into a single PDF document, add or remove pages from a document and change their order, or edit text and copy pictures and text from PDF files to other applications, all without the need to convert PDF documents to an editable format. It also has a number of features for commenting, discussing documents, and creating document archives. ABBYY PDF Transformer+ can convert PDF documents to two popular ebook formats: EPUB and FB2. You can read these ebooks on your iPad, tablet, or other mobile device. ABBYY PDF Transformer+ is built around the concept a unified interface: all of the primary functions can be accessed from a single window, making work with PDF documents simple and efficient. It is also an ideal choice for viewing PDF documents of any length thanks to additional navigation tools. ABBYY PDF Transformer+ offers easy-to-use tools for editing PDF documents. You can correct typing errors, copy text and pictures, post comments and much more without converting PDF documents to editable formats or searching for the files they were created from. ABBYY PDF Transformer+ is capable of searching for keywords in PDF documents of any type. This search includes not only the document’s visible text, but also hidden information such as comments, bookmarks and metadata. You can easily find, select or delete words from the document. Additional scanning options let you improve image quality, decrease the size of scanned files and automatically convert scans into searchable PDF documents. Create PDF documents from image files of popular formats: JPEG, JPEG2000, BMP, JBIG2, PNG, GIF, TIFF. ABBYY PDF Transformer+ lets you sign documents with a digital signature. Digital signatures, just like regular signatures on paper documents, are used to confirm the identity of the person that signed a digital document. They can also be used to prevent your PDF documents from being accessed and edited without authorization, adding another layer of protection.